The Vision. 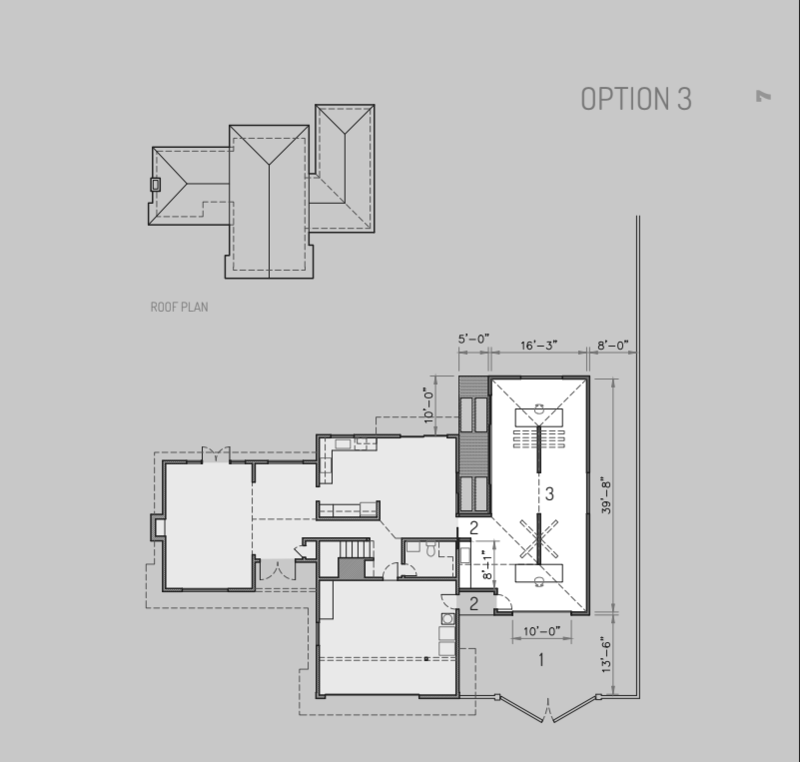 The concept drawings are amazing (see below), and now the architects at DIG:A (I love them, they are so talented) are creating construction drawings so that I can get contractor bids. Go to my website, find a piece or pieces of art you would like to purchase. Prices start as low as $75 and go up from there. Email me the name of the piece or pieces and the address where you want the art shipped. Once the invoice is paid, I ship your art. It should be to you within a week. All proceeds from this campaign go directly toward building the studio. I decided to build the studio at my home because I want my children to see and be a part of my work as an artist. DIG:A's design allows views of the studio from the kitchen through a glass atrium, making art the backdrop for our home life. Thank you! Many thanks to everyone that has already supported me and my work. You've contributed so much to the success that makes the prospect of a studio even possible. ​Jackie Leishman’s massive installment of The Many Faces of an Eve reflects a pluralistic perspective on the elusive woman. Taking both directives to go big and go home, Leishman exposed eighteen large prints on silver gelatin emulsion, painted onto various substrates, drawing inspiration from her Christian background and experience as a woman. Her use of emulsion on a homemade collage of substrates adds a painterly grit—an additional dimension of texture to the otherwise flat and degraded tonal scale of the images. The simplified close-ups force the subject’s expressions and penetrating gaze to be the point of impact—and it is haunting. Leishman’s Eve is weathered and worn (emphasized by the splotches and holes in the artwork), but resilient. Her steely eyes and undecorated face deny the social conditioning of women to preen and smile, as much as Leishman’s aesthetic choices reject typical practices of contemporary photography in a digital age. In the muted coloring of the earthy browns as well as the facial expressions and raw materials employed, this art is a rare natural take on Woman, rejecting any commercialization or sexualization. Rather, the subject’s many faces expose the inglorious parts of the female role. Leishman skips the pleasantries and reveals the messy complexities of womanhood and motherhood by using unrefined brush strokes and technically imperfect methods of photography. The titling of the piece would suggest that this feminist message has been relevant since the beginning of womankind, with the organic matter and craftsmanship also hinting at the Creation and mortality. Without casting judgment, Leishman humanizes and softens the proverbial narrative of Eve as the first sinner—the wily temptress. By using antiquated methods and removing any dated clues in her photography, Leishman shares a precious, timeless narrative which would be impossible in an inkjet print. Without a timestamp, these portraits become mirrors, relatable to women of all ages, who share the experience of those imperfect moments indicative of fallen (wo)man. There is no sign of Adam. This piece is focused solely on Eve, not as other to man, but as the center of life. 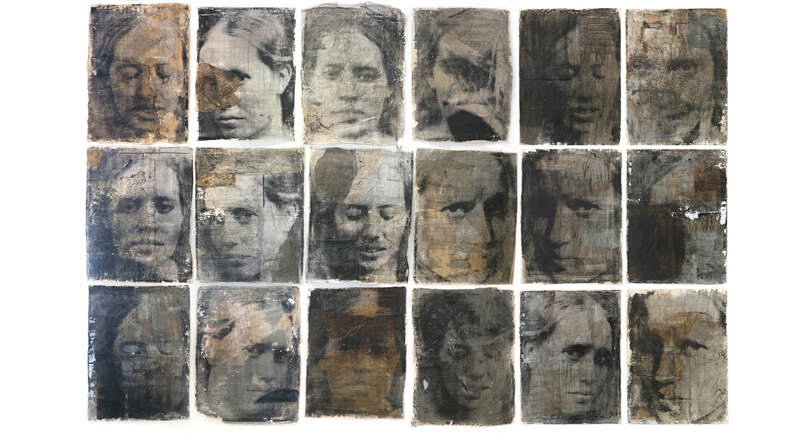 Leishman literally reproduces Eve, using repeated images with some variation of encaustic painting, medium, or reflection. This repetition bears a connection with recursive phases in a woman’s life, as well as the infinite iterations of creation, both divine and human. Leishman reveals this particular Eve in a feminist light. She depicts her as a strong woman capable of feeling and choosing anything she wants. With her eyes, she seems to be asking for those feelings and choices—universal to any women—to be respected. The sheer size of the piece also imposes a powerful presence, giving Leishman’s work and her reformed Eve the attention that is due. Through this piece, Leishman offers a unique perspective which the world is desperately lacking. Her protagonist differs from the naïve, fig-leaf-clad Eve we all expect to see in a quiet oil painting. This Eve is nonfiction. She is real and aware. She is a symbol of strength, not weakness. Leishman refutes the age-old singular narrative, trading it in for a more pluralistic, personal, and empowering story for all. "Plants (God's sketchbook)", 40 x 40", 28 pieces, 6 x 6 inches each, mixed media. “If we ever wake at all” is the quintessential problem of our age. As we grow more confident in our knowledge of how the world works and our place in it, there always looms the possibility that we have overlooked the beauty, wonder, and perplexing nature of not only our existence, but of the existence of all things. Leishman’s nuanced and engaging work beckons her audience to “re-mystify” our ideas of creation, existence, and the meaning we ascribe to our experience. The work hearkens to all essential, primordial works of art that problematize our comfortable notions of truth and call for us to re-think what we thought we already knew. In the same way that a groundbreaking piece of music or an important book adds to our imaginative toolkit for understanding the world, this work adds to our imaginative vocabulary for understanding the beauty of the relationships between creation and destruction, life and death, and meaning and meaninglessness. 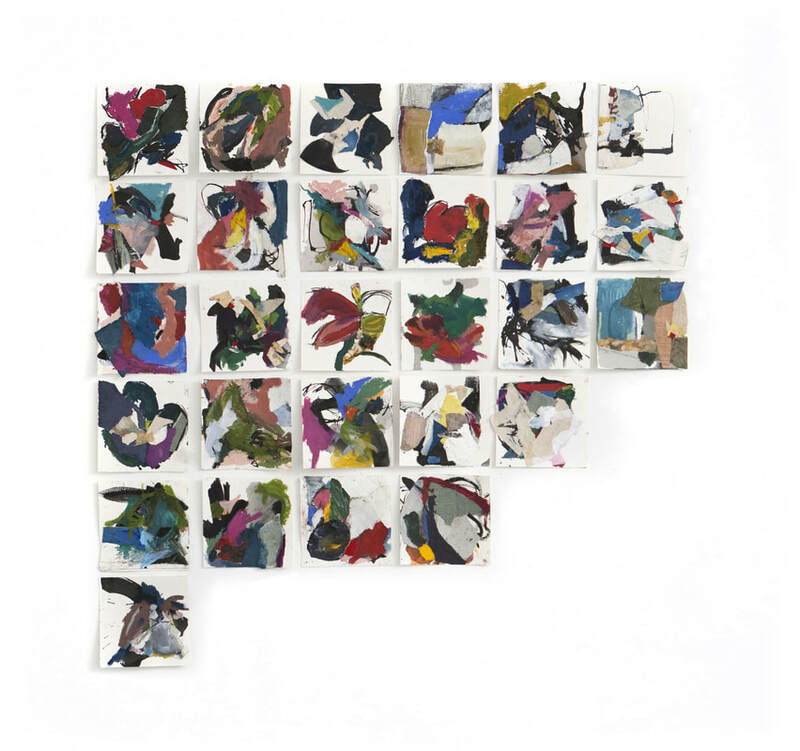 The way Leishman explores matter, light, water, plants, and human existence squarely places her work in experimental approaches that expand the traditional boundaries of art. However, in expanding the boundaries of art Leishman’s “If we ever wake at all” brings us squarely back to one of the questions that perpetually haunts humans—the question “why is there something rather than nothing.” This question seems to have lost its charge in contemporary culture as we often blithely ignore what it means to be in the world, in the universe. But if one steps back for a moment to ponder with wonder the fact that we live in a complex, intricate world in which humans have life, can experience joy, and can contemplate the nature of our existence, then one is filled with amazement. Perhaps the reason we have lost the flavor of the question as to why there is something rather than nothing is that we have become stultified in our easy-to-use narratives by which we hope to explain everything. Those of a scientific mindset or who believe they are reasonable people use the findings of science to understand how things work. Those with religious inclinations look to scripture to find the beginnings of the universe. The problem with such simple bifurcations in our narratives about the mysteries of creation is that they often exclude as much as they explain. While many would place Leishman’s work in the category of abstract expressionism, there is something more primal and evocative in her work than that of an artist simply trying to adhere to fashionable art etiquette or styles. Her work evokes the efforts of our earliest ancestors in portraying their world through expressive depictions. Primitive art has the element of wonder about a world which probably seemed so grand and moving to those early artists. Though it is impossible for a contemporary audience to situate itself in the primitive landscape, to see the world through the eyes of those artists who left behind the earliest traces of how humans conceived of the world and their place in it, with imagination we can recognize the elemental attempts to understand the way the world unfolded to our earliest ancestors. This work invites us to rethink, or perhaps, better put since we seem to have lost our ability for thinking deeply and imaginatively about the world, to start thinking again about the processes on which our very existence depends. While this work finds a great deal of its roots in a reawakened primitive expressive depiction of creation processes, it does not offer simple answers or a prefabricated narrative to which one must adhere. Any serious viewer of Leishman’s work is one who has accepted her invitation to be a participant in attempting to understand the complex dialectical nature of destruction and creation, expansion and contraction, and, ultimately, of the ways in which life itself moves across the elements of the universe like wind across the waters of the ocean. It is in Leishman’s creative rendering of that which we often take for granted, such as matter, light, and water, that she urges us to wake and to reconsider the intricate mix of our existence. What Leishman seems to do with ease is to remind us that the universe is at the same time both simple and complex. Whatever the universe is, it demands that we think about it, the processes by which it came to be, how we come to interpret this coming-to-be, and what meaning it has for us. While much of the art one finds today sounds a tocsin against meaning and revels in purposelessness, Leishman boldly sings the clarion call that we are alive, the universe is here, and that part of the joy of being human is to imagine and reimagine the possibilities of our existence. She invites the audience to think hard and wonder about the implications of a creation that is always ongoing. Her work entices one to rethink one’s place in the universe. Leishman’s work portrays a continual flux, the never-ending flow of energy and matter moving from one form to another as something that is both concrete—we can understand it through science—and ineffable—its majesty is beyond our grasp. Like the universe itself with no easy roadmap or guidebook to help us along, she challenges her audience to see the perpetual play between meaning and meaninglessness. The work challenges us to wake up, to live life awake. There are several series in this body of work, each a taking different approach to this perpetual play. In the Moon series, one sees a rather simple coming together of disparate parts. From chaos and complexity comes a simple unified object in the moon. Leishman seems to be presenting to her audience a rather straight-forward rendering of the way most of us take creation to be. Typically, we see only think of coming-to-be as a straight-forward process of chaos coming together to make something unified and whole. Certainly, that is one part of the story, though only one part. Reminders of the playfulness and complexity of creation are found everywhere throughout these series. In “Plants (God’s Sketchbook),” Leishman reminds us that the universe is not on a strictly deterministic path. Perhaps play in coming-to-be is something we should all consider more seriously. The luscious palette Leishman uses to illustrate the beginnings of plant life and the elements of chance in the coming-to-be of life show the audience that we can and probably should rethink our conceptions of how the world came to be: Whether one holds that there is a supreme being who organized it all or one holds that the universe is actually a multiverse, Leishman reminds us that the coming together of creation is as much a work of art as anything else. Perhaps the most compelling piece of the series is “The Many Faces of an Eve.” Here the artist finally introduces humans into the mix. Whether one holds a strictly religious viewpoint or a scientific one, or something in between, it is the case that humans came after the rest of creation. However, given that we are each always fundamentally human, limited and yet endlessly ambitious, and that we are the purveyors and givers of meaning to our experiences around us, it is critical that we think deeply about how we help to construct creation. Interestingly, Leishman chose to portray this first human to make an appearance in this body of creation though a series of similar, yet dramatically different renderings. This series of an Eve seems to show that we are all infinite in our possibilities, in the ways in which we can come-to-be, and that there is no simple deterministic path which any of us takes. But, each Eve is also so obviously human as well. “If we ever wake at all” invites our contemplation. It invites a wrestle. As human hubris often leads us astray in thinking that we know or can know everything, Leishman works to reign that impulse in so we can reconsider our place in the universe. We must wake again and again to understand that the universe is a place of infinite beauty and meanings, where all is always being created, destroyed, and recreated. Leishman reminds us, the meaning-giving and meaning-seeking creatures that we are, we must wake to see the beauty and the majesty of this eternal process. The Many Faces of An Eve, 18 pieces 30" x 22" each; 94" x 140" installed, Photographic emulsion on mixed media.